Five online satellite winners from Intertops Poker and Juicy Stakes Casino are making their way to the Caribbean to compete in the $250,000 GTD WSOPC St Maarten Main Event this week. The poker blog, Living the Dream, will be publishing pics and videos from the casino, the resort and the beaches plus daily freeroll passwords! "The resort is between the casino and that beach where everyone goes to get blown around by KLM 747s," laughed Intertops' poker manager. 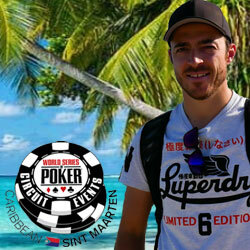 "That may be how most people know St Maarten, but poker players know it as a great place to play poker!" Lukas, Daniel, Phil, Chris and Chris will converge on the Caribbean from Germany, Hungary and America. They may come from different places, but now they share the same goal. Each champion took down an online satellite at Intertops or Juicy Stakes and won a $4500 prize package that includes the $1700 Main Event buy-in and luxury accommodation at the Sonesta Maho resort. Chris Perkins won his way to St Maarten at Intertops a couple of years ago. Since that first taste of international competition, he's quit his day job and has been travelling and playing poker. "I'm super excited to go back to the island," said Chris. "I hope everything looks close to normal after the hurricane." "I played a $2 rebuy to win a seat into the $110 satellite where I won this trip!" said Phil who also won his way to Punta Cana at Juicy Stakes Casino three years ago. "I'm a recreational player. I work for an architect firm in Pittsburgh, but I play tournaments at the casino near me every now and then. Really looking forward to going back to St Maarten!" Intertops Poker and Juicy Stakes Casino are well-known for their daily online poker tournaments. This Saturday is the next $600 GTD Bounty Run Tournament. Players are paid a $2 bounty for every player they knock out. First and last place players get a free ticket to the Bounty Run Summer Special in June where the prize pool bumps to $1000 GTD and the bounty is doubled. Buy-in for Saturday's game is $10 + $1 but two tickets to the monthly event will be awarded to the winner of the $2 Bounty Run satellite this Wednesday night. Details are available at https://poker.intertops.eu/en/promo/413-bounty-run-series and https://www.juicystakes.eu/poker/tournaments/bounty-run-series. March 29 – April 1, The Living the Dream poker blog (http://www.live-dream-poker.com) will publish photos and videos of the players in the casino and around the unique tropical island as well as passwords for daily $100 GTD freerolls at Intertops and Juicy Stakes.